The Delbrook Resource Opportunities Fund declined -6.7% in March. On a gross basis, long positions returned -10.4% and short positions +1.7%. The Fund’s annualized return since inception is +14.4%. From a commodity exposure standpoint, base metals comprised 46.8% of the Fund’s exposure, while precious metals accounted for 42.8%. Long positions in mid-capitalization precious metal equities were responsible for the majority of the declines during the month. On specific names, the Fund increased our long exposure to Torex Gold (TXG) – an intermediate gold producer focused on the Morelos Property, 180 km southwest of Mexico City. Throughout the first quarter tensions with a rival labour union escalated, ultimately forcing a temporary suspension of operations and a >20% drop of TXG’s share price throughout March. On April 6th the company issued a press release announcing the end of the blockade. On the back of that news, TXG’s share price has increased by approximately 60%. Moving into the second quarter, here are a few central themes we will be monitoring. Relative Value: GLD vs GDXJ -- Why are gold stocks so cheap? As mentioned in our last newsletter, we are closely monitoring the spread between the GLD vs. GDXJ (gold vs gold equities). We believe this gap is unsustainable and we are betting that mean reversion is set to occur. The ETF net flows, which have been heavily in favor of commodity-backed funds, are a good proxy for market sentiment and should provide an early signal as to when the reversal has begun. The multi-year under investment of capex in the mining sector will have severe consequences for select commodity prices. As majors shift focuses from balance sheet repair and dividend programs, they are beginning to wake up to another pending crisis – sufficient replacement ounces simply aren’t in the pipeline of most companies. In the case of gold, zinc, copper and nickel, we believe the market has misunderstood the degree to which M&A is required to meet this demand. 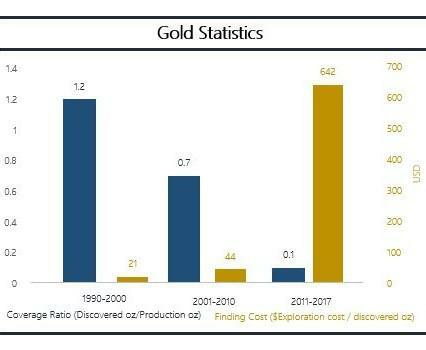 The argument for the acquisition of existing gold ounces vs. funding greenfield exploration has never been stronger. The chart below shows that between 1990 – 2000 the cost of a greenfield exploration ounce was $21; between 2011-2017 that number ballooned to $642. The key takeaway from these figures is that it doesn’t make economic sense for the majors to be in the exploration game. There is only one way to solve the replacement ounce/pound problem – M&A. Therefore, we are on the lookout for quality assets that will be prime targets to be taken out. Look for this trend to accelerate throughout 2018 and beyond. Inflation expectations are rising. 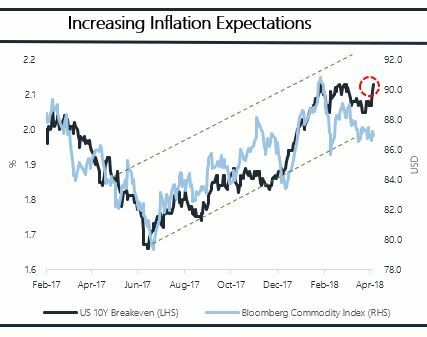 The US 10-year breakeven inflation rate, which is the yield difference between nominal 10-year Treasuries and 10-year TIPS (Treasury Inflation Protected Securities) has been increasing since mid-2017 and recently hit its highest point in three years. Therefore, as commodities outperfom nearly all major asset classes during inflationary periods, we remain bullish on the sector and will continue to run the fund with a net long bias for the foreseeable future. As always, please contact our office at 604.229.1450 with questions or comments.